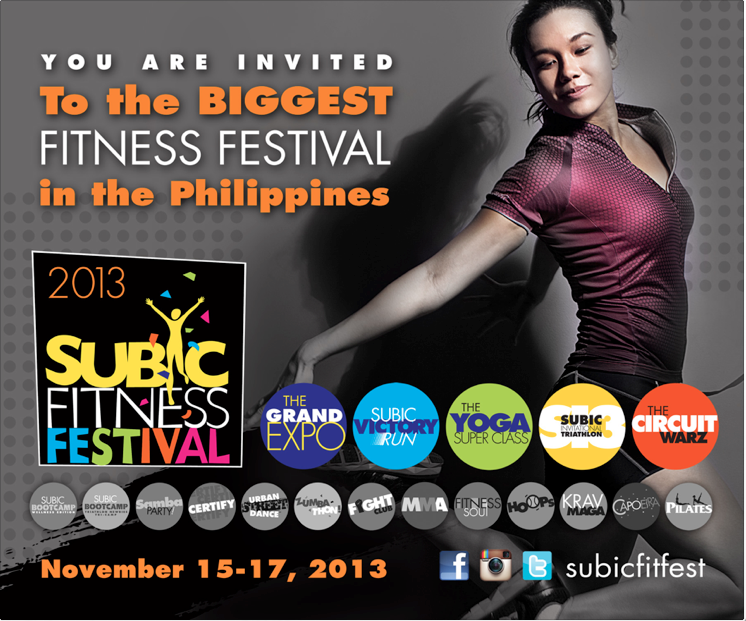 Said to be the biggest fitness event of the year, Subic Fitness Festival, happening on November 15, 16, and 17, 2013 at Subic Free Port Zone – Harbor Point, Camayan Beach and Ocean Adventure – starts its journey to Subic with free fitness sessions in Manila, all weekends of September and October. A grand festival that aims to promote a holistic approach to fitness amongst Filipinos, F&F Events, along-side Subic Bay Metropolitan Authority (SBMA), declares that fitness in body, mind and spirit is definitely for everyone! Kicking off at the FTX gym along Tordesillas St., Makati, on September 6, 7, and 8, 2013, from 6p.m. to 9 p.m., the series of events will feature all the fitness disciplines headed to the main gathering. This is surely the chance for every Juan, Maria, Boyet and Nene, to have a taste of the SubicFitFest experience. 2008 Mr. Philippines title holder Reijo Maranan del Prado, challenges fitness buffs to break records through functional body weight and resistance training with Circuit Warz, on Friday, September 6, 2013. Learn the preparations involved to qualify in the Gladiator Circuit Battle, Extreme Enduro-Challenge, Strong Man Competition and Tug-of-War. The free circuit training is open to individuals and circuit teams alike, featuring speed-repetition, speed-endurance and power-weight exercises. Dance the work-week stress away on Saturday, September 7, 2013, with Urban Street Dance. Shed starched shirts for basic tees and move to your favorite groove for a fun-filled, high-energy, cardiovascular work-out! Bring your family, round up your friends, and let the SFF crew teach you how to stay in-sync anywhere and everywhere! Sunday is a treat for the spirit as International Meta-coach, Imee Navarro, teach individuals how to unleash their greatest potentials. On September 8, 2013, learn to express your power with neuro-linguistic programming, self-contemplation, and meditation techniques. Move within your mind and experience results physically and mentally, through the guidance of EQ Academy with Soul Fitness. Limited slots are available. Contact Ramon Domiquil at 09159425926 for inquiries and reservations. For more updates check out SubicFitFest on facebook and twitter.